The background on the legal issues behind the 1919 World Series scandal is covered in part one of this series, which focuses on third baseman Buck Weaver. The subject of this article is the team's left fielder and best hitter, Joseph Jefferson Jackson, possessor of one of baseball's most colorful nicknames, "Shoeless Joe." It was a Greenville, South Carolina sportswriter named Scoop Latimer who hung that tag on Joe, based on an incident in his first year of organized ball. Jackson hated the moniker, which made him seem like a barefoot yokel, but it endured and remains eminently recognizable even to people who know nothing of baseball. On the other hand, if you believe that success came to him effortlessly, you are better off not knowing about his two partial seasons playing for the Philadelphia Athletics. The big club called Jackson up in 1908, when he punished American League pitching for a mighty .130 average, and then again in 1909 when he raised the bar to .176. For the two years combined, he batted .150 with no extra base hits and a single walk, for an OPS of .321. That translates to an OPS+ of only 1, on a scale in which 100 is an average player. Joe had the talent even then, but he was full of self-doubt. A country boy from a rural mill town in South Carolina, he was totally intimidated by the size of Philadelphia and the rude treatment he received at the hands of his teammates, northerners who ridiculed him for his lack of education, his uncouth manners, his suspicious nature, and his offbeat superstitions. (He once had an astounding day after a young girl gave him a hairpin, so he would never again take the field without a woman's hairpin in his hip pocket.) A typical group of ballplayers around the turn of the 20th century would never be confused with the Algonquin Round Table to begin with, but even by their minimal standards of sophistication, Joe was a rube. According to most sources, he had started working in the local textile mill when he was six or seven and never went to school at all. SABR's Black Sox committee reported (December 2012 newsletter, page nine) that Joe claimed in the 1940 census to have a third grade education, but if he lasted that long, he wasn't destined to be valedictorian because the adult Joe could neither read nor write. After the first game he played in Philly, he lasted only a few days in town before getting on a train back to South Carolina on the pretext of tending to a sick uncle. The team dragged him back soon enough, but he left again after a frustrating 0-for-9 double-header in September, this time without permission, and was then suspended from the team. Contrary to a newspaper headline which claimed he would never play organized ball again after that suspension, Joe was back with the club again in spring training, although he never did adjust to life in Philadelphia, and he never did fit in with his teammates. 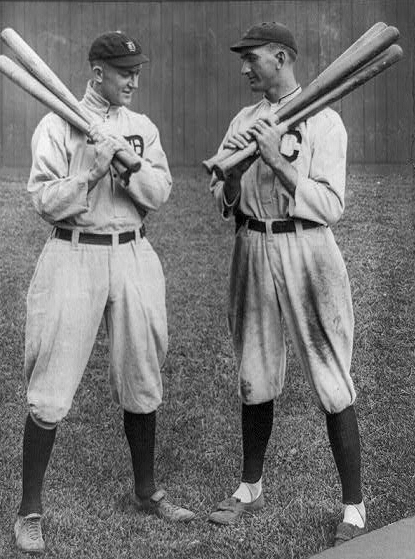 He did admire manager Connie Mack, but Mack liked intelligent ballplayers, so it was probably inevitable that a man called the Tall Tactician would eventually give up on a bumpkin called Shoeless Joe. In a rare strategic misstep, Mack lost one of the best three-season performances in the history of the game when he sold Joe to the Cleveland Naps. Joe assimilated more easily with his new peers, among whom were many other players from the South, and his improved comfort level allowed his brilliant baseball talent to shine through. In his first three full seasons in Cleveland, Shoeless Joe hit the baseball as well as anyone ever has. The great Ty Cobb was then at the peak of his abilities, and a comparison of their performances from 1911 to 1913 indicates that Joe was approximately as good as Cobb. The only strong argument to prefer Cobb in that comparison is that he was a far better base stealer, and that was at least somewhat offset by the fact that Joe walked more, struck out less, and hit more doubles. That's how good Joe was then: about as good as Cobb at his best. 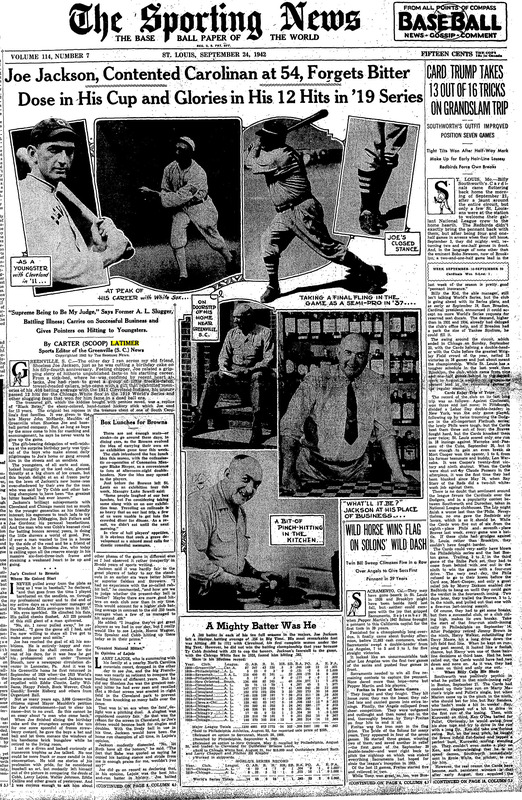 Competing directly against his legendary teammate Nap Lajoie (who was so good the team was named after him) and other future Hall of Famers like Cobb, Tris Speaker, Eddie Collins and Home Run Baker, Joe led the American League in hits in two of those three years, and led at various times in doubles, triples, on-base percentage, slugging average, and OPS. He is probably the once and future possessor of the record for the best batting average by an official rookie, because his astonishing .408 mark is not likely to be matched. Among players with 500 or more plate appearances, no subsequent rookie has come within fifty points of that mark. Because contemporary pop culture has apotheosized Shoeless Joe, it is not generally remarked that Joe was never really as good again as he was in that initial period, at least not until the introduction of the "lively ball era" in 1920. In those first three full seasons he was really as good as his legend, but in the subsequent five years, playing for Cleveland, then Chicago, he was plagued with problems. He injured his knee severely in an auto accident on July 7, 1915 and was out of the line-up for the next three weeks. He batted only .297 for Cleveland after the accident. Fearing a steep decline in his performance, and thus his monetary value, the club decided to sell him to Chicago that same summer, while his asset value was still high. 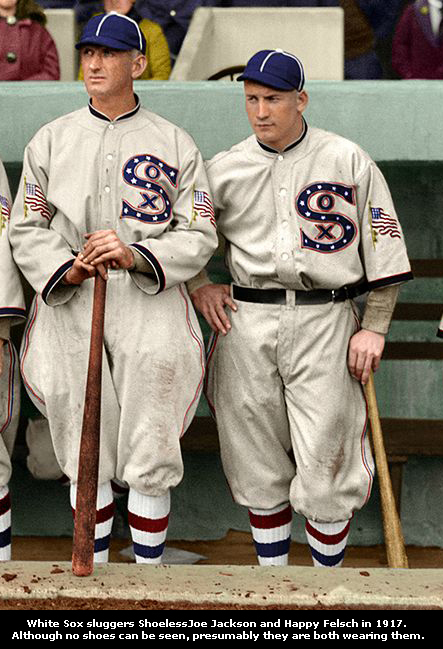 He played the remainder of the 1915 season for the White Sox, but batted only .272 with his new club. His knee recovered in the off-season and his performance improved significantly the next year, but 1917 proved to be another disappointing season. The White Sox won the pennant that year, but Joe was hitting poorly because of an ankle injury sustained during spring training. His batting average dipped to .261 on August 11th. A late-season surge lifted him to .301, but he finished the season with only 13 stolen bases and 75 RBI. 1918 proved to be an even more miserable year, as he missed nearly the entire baseball season because of World War I. By the end of the five-year period from 1914 to 1918, Joe's lifetime average had dropped 40 points from its high water mark. He was still one of the game's strongest offensive forces, but he had dropped to a level achievable by mere mortals. Isn't who you think it is. And a lucky hairpin in his hip pocket. The answers to three questions determine the relative guilt or innocence of each of the Black Sox. The answer to the first question about criminal conspiracy is a resounding "no" for all of them, including Joe. 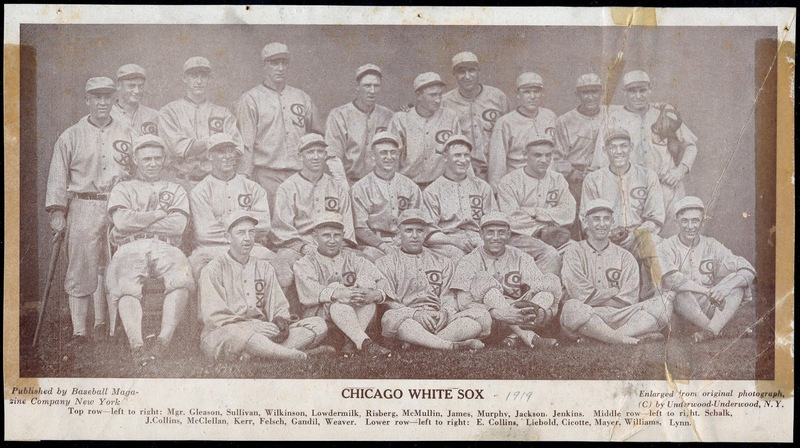 Even if every accusation against them had been true, they were not guilty of a crime, based on the judge's instructions to the jury in the Black Sox criminal trial. Throwing the World Series was not a crime in 1919, and neither therefore was conspiring to do so. Legally, the players were simply getting paid to lose baseball games, just as Comiskey had paid them to win. In agreeing to do so, they may have failed to honor their contracts with Comiskey, but contractual disputes are a matter for the civil, not criminal courts. The players were brought to trial on contrived charges which were virtually impossible to prove beyond a reasonable doubt. There was no convincing evidence that they intended to defraud bettors, their boss Charles Comiskey, or their guileless teammates. In fact, the prosecution made no mention of "conspiracy to defraud" at any time during their case, thus making the jury's decision a simple and obvious matter. A somewhat more detailed overview of the legal niceties may be found in Part I of this series. A truly detailed and painstakingly assembled overview is presented in "Black Sox in the Courtroom" by William F. Lamb, a former prosecutor whose 2013 book is must reading for anyone interested in the legal aspects of the Black Sox scandal. "I handled thirty balls in the outfield and never made an error or allowed a man to take an extra base. I threw out five men at home and could have had three others, if bad cutoffs hadn't been made." "In the fourth inning of Game One, Jackson fielded a ball hit to the base of the wall in left-center field. The ball was played into a triple, in part due to his casual fielding. Two runs scored. The next batter hit a ball to left field for a hit, which Jackson gathered and threw late to the infield, allowing the runner (Morrie Rath) to reach second. Eddie Collins later testified that he found the play puzzling because Jackson rarely made such mistakes. The following batter singled, scoring Rath." One may not assume that there was any dishonesty involved in any of the plays cited above. Even the greatest players drop balls and make bad throws. They do so far less often than you or I would, but they do so, even in critical moments, because there is no such thing as baseball perfection. Willie Mays made more than a hundred errors in his career, as did Joe DiMaggio, Tris Speaker and Shoeless Joe Jackson himself. 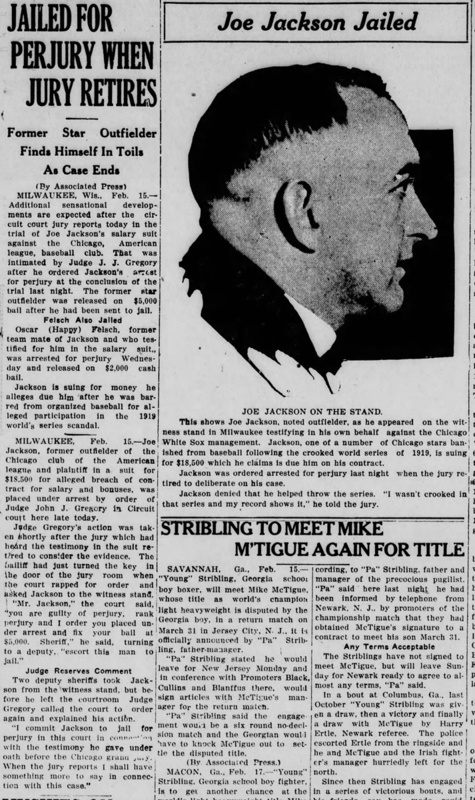 But if Joe Jackson's fielding in the 1919 World Series provides no definitive evidence of malfeasance, neither can it exonerate him, as Joe and many others have claimed. Nor is it possible to assume that Joe's exaggerated description of his play, as recalled three decades after the fact, is evidence of a cover-up. As an illiterate man in an age before television, Joe could rely only on his memory to reconstruct the past. He may have repressed the memories he regretted, thus genuinely believing his preferred version of those events. Even those of us with access to written or recorded evidence sometimes do that. Joe did bat .375 in the 1919 World Series, but that fact alone provides no evidence that he did his best at the plate. 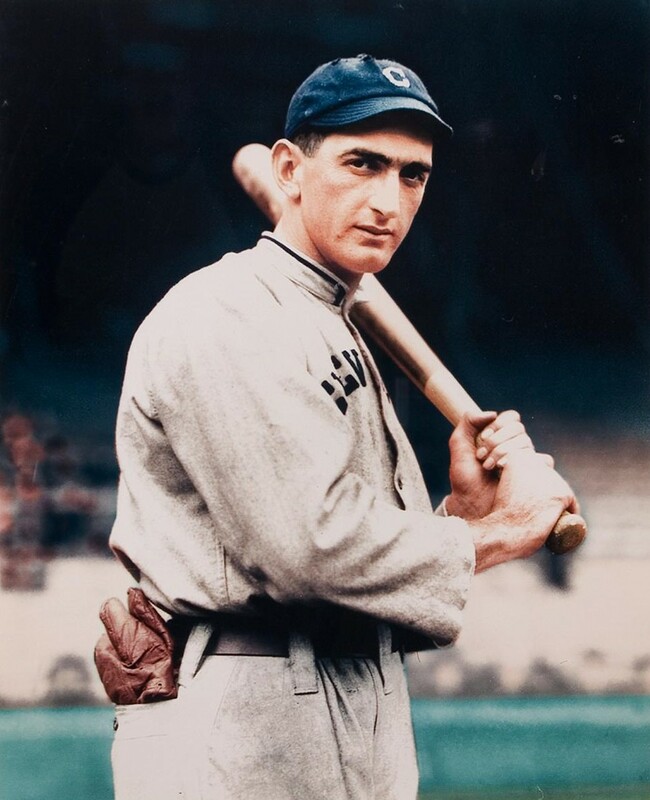 He batted .351 in the season before that series and .382 in the season after it, so for the great Shoeless Joe Jackson, a .375 batting average was just a routine series. Given the small sample size of eight games, that performance proves nothing. Perhaps a full effort from Jackson in those eight games in the fall of 1919 would have resulted in a .500 batting average, as it did in the first eight games of the regular season that year. Or perhaps he gave his all on every plate appearance. He did have one very suspicious strikeout in game six, which is discussed in another article in this series. But suspicion is not proof, even in an unlikely situation like that strikeout, the likelihood of which was no more than 1-in-60, probably as low as 1-in-100. To conclude either way would be pure speculation. The remaining key question involves whether Joe was part of the conspiracy to throw the World Series. The answer is an unequivocal "yes." Whether or not he played his best (and he always claimed to have done so after his meeting with Judge McDonald), his part in the conspiracy is established by his own testimony to the grand jury. If throwing the World Series had been a crime at the time, he would most certainly have been guilty of conspiring to do so. His teammate Chick Gandil offered him ten thousand dollars to help throw the World Series, and he refused - until Gandil upped the offer to $20,000, at which point he agreed. The amount was to be paid in installments after each game. After game one of the series, not having seen a penny of the promised money, he asked Gandil, "What is the trouble?" Then, after "we went ahead and threw the second game, we went after him (Gandil) again." After the third game, still having received no cash, he told Gandil “Somebody is getting a nice little jazz, everybody is crossed.” Gandil told him that the gamblers had double-crossed the players. Finally, before the return trip to Cincinnati for game six, teammate/roommate Lefty Williams handed Joe an envelope containing five thousand dollars. Jackson had expected more by this time, so he asked Lefty "what the hell had come off here," and was again told they had been double crossed. Jackson could only speculate whether he had been cheated by the gamblers, by Chick Gandil, or even by his friend Lefty Williams. He suspected any or all of them. 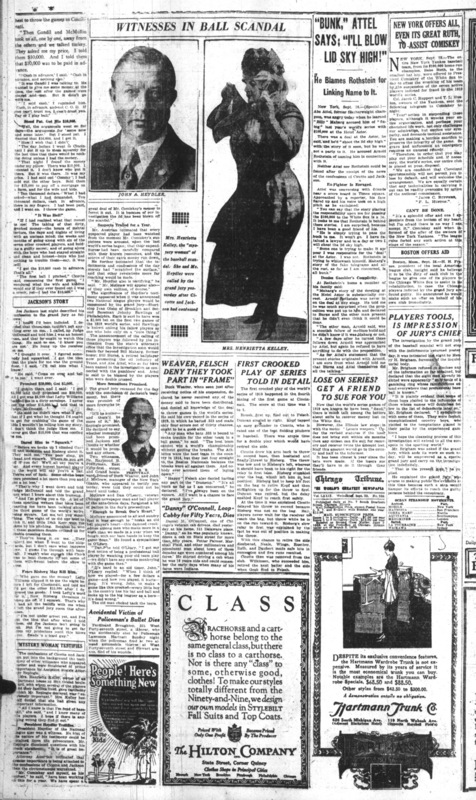 Joe later changed his story, making himself seem innocent, thus hoping to bolster his claim for back pay in a subsequent civil suit which was tried in Milwaukee in 1924. In his revised story, he claimed that he had never agreed to accept any money, but had simply been handed the $5,000 by Lefty Williams after the series was over. In this version, Williams told him that some of the the guys had used Joe's alleged participation to sell the deal to the gamblers. Hearing this, an outraged Jackson supposedly went immediately to Comiskey's office to tell him what had happened - and was rebuffed by Comiskey's secretary. This story contradicted not only Jackson's previous account, but the sworn testimony of Lefty Williams and even that of Jackson's own wife! Jackson testified to the new story under oath in his civil suit, which gave him a sticky perjury problem, since he had once told a different, contradictory story under oath in the grand jury proceedings. Given the discrepancies, he logically had to have perjured himself one time or the other. Joe chose a bizarre strategy to work his way out of this dilemma. When he was cross-examined about the contents of his grand jury testimony in 1920, he did not attempt to blame coercion or a faulty memory. In fact, he made no attempt to reconcile the differences between his two versions of the narrative. He simply denied saying everything he had said to the grand jury, offering statements like, "I didn't make that answer." When confronted with the particulars of his testimony, he denied everything line-by-line, more than a hundred times under oath. He seemed to be unaware that the court record consisted of more than just some typed pages. The judge, the court stenographers and the grand jurors were all still alive and available to verify that the transcript was an accurate account of what Joe had actually said. Some of them were called to provide that testimony, thus leaving Joe with an additional hundred or more instances of perjury which could be proved beyond a reasonable doubt. In fact, beyond any doubt. The presiding judge became so frustrated with the entire proceeding that he sent the jury out of the room and had Joe thrown into a jail cell, arrested for perjury in his own back-pay suit! There was one time when Joe called Commissioner Landis to ask for a chance to explain his position. 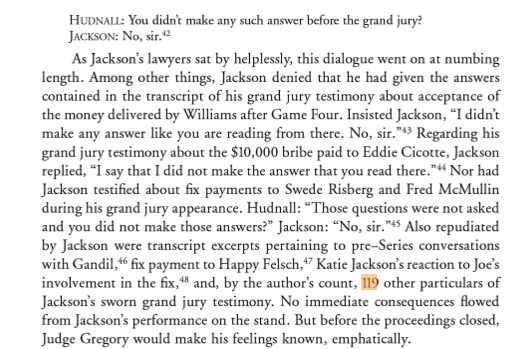 Landis told sportswriter Frank O'Neill: "Jackson phoned and asked whether I would give him a fair hearing. I said I give every man a fair hearing. Jackson said, 'Thanks, Judge. Do you know that those gamblers never paid all they owed me?'" (Rothstein, David Petrusza, p. 366) The hearing ended there. Joe was banned from organized baseball after the criminal trial, but continued to play ball for many years in textile league, sandlot and semi-pro contests. 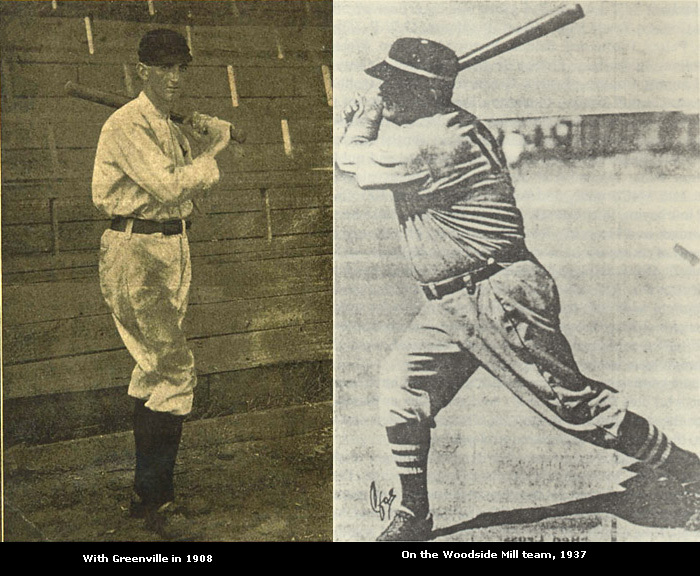 He played for the Greenville Spinners in 1932, more than a decade after his banishment from the big show. There he still hit the ball hard and regaled the locals with stories of the old days, including the origin of his legendary dark bat. Although aging and gray, Joe still appeared to be in playing condition, and was still wielding Black Betsy, as pictured here. 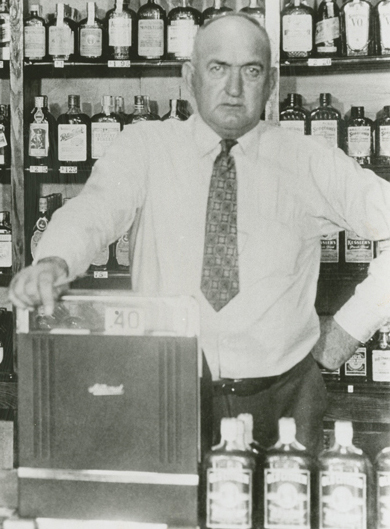 When he wasn't playing ball or coaching the local kids, he and his wife ran a successful dry cleaning business in Savannah, then a liquor store in Greenville, South Carolina. By all accounts, he could still hit the ball authoritatively for the Woodside Mill team until he was fifty, even as his fielding declined under the weight of some seventy additional pounds. He told The Sporting News in 1942 (cover story, story continued) that his weight had climbed as high as 254 pounds, compared to 170 at the start of his career in the minors, and a major league playing weight of 186. The images below show him at the beginning and end of his adult playing days. The extra weight contributed to health problems and Joe had several minor heart attacks over the years. The fatal one came on December 5, 1951 in Greenville, where his obituary mentioned that he was widely loved in the community. 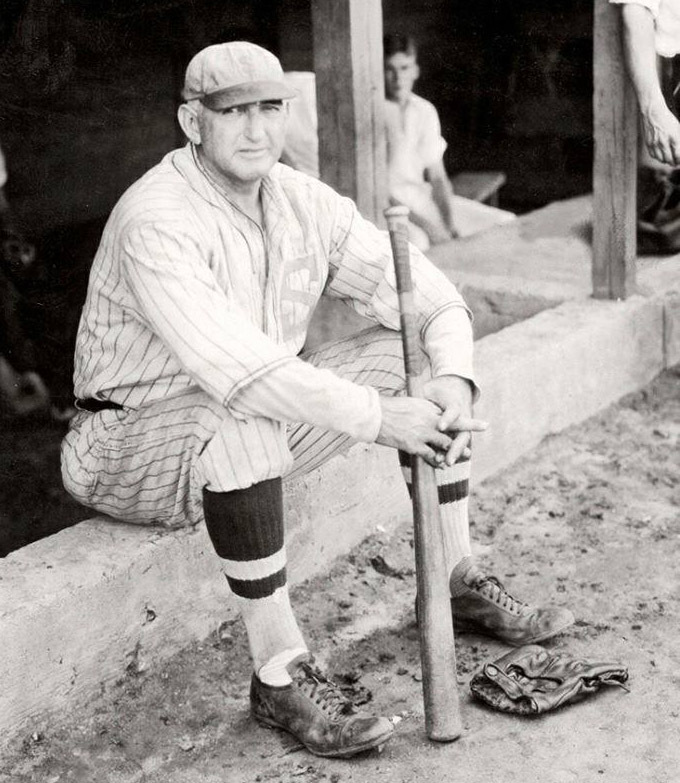 Shoeless Joe Jackson did not instigate or design the World Series fix with the gamblers. Two of his teammates, Cicotte and Gandil, did that. He did not attend the strategy meetings, meet with the gamblers, or join the inner circle like Gandil's henchmen, Risberg and McMullin. He didn't stumble his way through the World Series like Risberg, who batted .080 and made four errors, or Lefty Williams, who became (and remains) the only man to lose three starts in a single World Series by posting a 6.61 ERA, a preposterous figure in the deadball era. Shoeless Joe was roped into the conspiracy by Gandil. Before his grand jury testimony, he was hoodwinked out of his right to a lawyer by Alfred Austrian (Comiskey's lawyer). He was almost certainly tricked into thinking he was testifying before the grand jury with immunity from prosecution. He was probably not smart enough to know that his lies under oath represented to society a very different level of deception from simply telling a few old war stories and fish tales. He became beloved in South Carolina, and was worshipped by the local kids, for whom Joe always found time. Those are all mitigating circumstances, but make no mistake about it: he was corrupt. He agreed to take the money and then he kept asking where it was. He originally tried to make amends on grand jury day by telling the truth, but he changed his mind after that day and started lying about it. He lied under oath more than a hundred times at his civil trial, and then he continued to tell the same lies all of his life. In 1941, in reference to his grand jury testimony, he told Shirley Povich of the Washington Post, "There never was any confession by me. That was trumped up by the court lawyers." As time went on, the lies became bigger, until he was finally presenting himself as the man who gallantly threw out five runners at the plate while totally unaware of any skullduggery until after the World Series had ended, at which point he marched into Comiskey's lair and insisted on cleaning up the mess. Should we forget what he did, and all the lies he told about it, because he was a great player who wasn't smart enough to know any better? I don't buy it. I don't buy it for Pete Rose, and I don't buy it for Joe Jackson. Should he be in the Hall of Fame? I don't know. I can't answer that unless you tell me what the Hall of Fame is for. 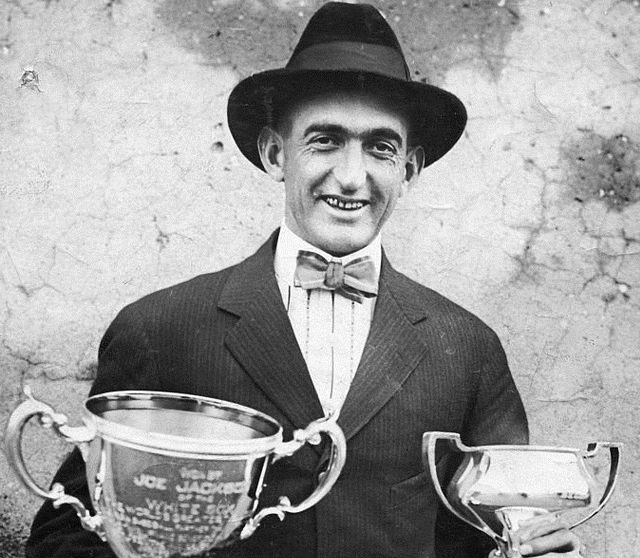 If it exists only to enshrine the game's greatest performances on the field, then Shoeless Joe absolutely belongs there. The adjusted OPS+ for his career is the seventh highest in history. From 1911 to 1913 he was as good as anyone ever was. The man hit .408 as a rookie, for heaven's sake. On the other hand, if the Hall exists to enshrine those who played well and honorably, who graced America's ballfields and left the game better in their wake, then I would not vote to include a man who agreed to take money to throw a World Series. I know there are other scoundrels already in the Hall, but that is an unpersuasive argument to add one more. If I am asked to cast a vote for Fictional Shoeless Joe, that sympathetic, thoughtful, right-handed batter played by Ray Liotta in Field of Dreams, I'm all in, but the real man on the right leaves a sour taste in my mouth.